A while ago I reviewed the EinScan-Pro+, the successor of the original EinScan-Pro. Although I mainly focus on the Rapid Handheld scan mode in both reviews, I did note that with the Pro+, Shining3D had updated the HD handheld scan mode to a usable level. In that mode, you can still use the scanner in a handheld manner (as opposed to using it with the $799 Industrial Pack, which transforms it into a high-res desktop scanner) and capture geometry in a resolution that is higher than the Rapid Mode. You will lose color capture but since this mode is aimed at engineering and similar purposes that probably won’t matter to many users. But even in the updated version the HD handheld mode had two problems: it was still slow to use and it required placing marker stickers for tracking. Both result in longer and less comfortable scanning sessions. As we know by know, Shining 3D has made their EinScan line modular to accommodate specific use-cases. I recently reviewed the Discovery Pack for the Einscan-SE/SP desktop scanner series. 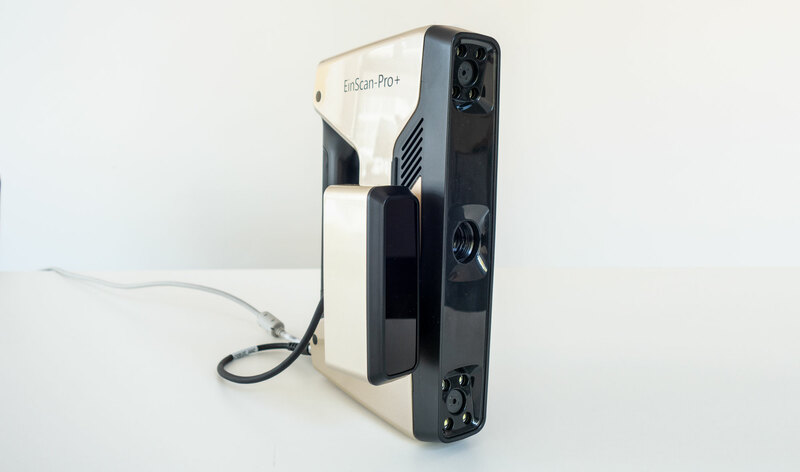 For the EinScan-Pro+, Shining3D has developed the $799 HD Prime Pack add-on. It connects to the side of the scanner and enhances specifications of the HD handheld mode. It promises 30% faster scanning while not requiring marker stickers for objects with enough geometric details (using markers is still possible). If you also got the Color Pack, which adds RGB color capture to the Rapid Scan mode, you’ll have to swap it every time you want to use the HD Prime Pack. But since you can’t capture color in HD mode anyway and swapping is easy that won’t be too much of a problem for most. When connected and activated, the software automatically uses the Prime Pack when choosing the Handheld HD Scan mode. The main difference is that you can now choose to perform tracking based on markers, or use the geometric features of the object for tracking. For this review I didn’t use markers in any of my test scans since I don’t like them anyway. While the Prime Pack is aimed at technical use cases, I started with my favorite test subject because I know this bust has plenty of geometric details and very few 3D scanners I’ve reviewed have had tracking problems with it. To make scanning easier, I placed the bust on an IKEA turntable. As you can see above, the HD mode with Prime Pack still projects a series of lines. As far as I can see the amount is the same as the built-in HD mode. The difference here is that the add-on had optimized sensors for capturing the lines and can do this a much higher frame rate. You will still need to move the scanner up and down to connect all captures lines but this is significantly smoother with the Prime Pack attached. After I had captured the front of the bust, I could then start rotating the turntable slowly while also moving the scanner up and down with my other hand. This all went pretty smooth and I could scan the complete bust without any tracking problems. As you can see, both Rapid mode results have similar level of details. However, the HD scan with Prime Pack has a lot more details. For comparison, I added the scan from the EinScan-SP (Review) which is strictly a tripod-mounted desktop scanner. These scanners typically deliver more detailed scans than handheld scanners. But in this case the HD Prime Pack Scan (full model below) and the SP scan (click here for the full model) show very similar details, which I find impressive. As you can see I’ve put the smaller objects on a wrinkled tea towel. This adds a lot more trackable geometry and greatly helped scanning. Without it, I had quite a lot of lost tracking issues but with this simple workaround I had very few and the software picked up tracking quite fast. Of course, you can easily remove this background material in the software but I chose to leave it in to illustrate that adding geometry could be essential if you want to scan without using marker stickers. As a downside, I discovered that this scanning mode very much prefers scanning under a straight angle. So either straight onto a large object that can stand on a turntable, like the bust, or straight down onto a table surface. Rotate it too far under an angle and it become a a lot more prone to tracking problems. Quality-wise these scans are all very detailed and are similar to that of some desktop scanners on the market. This essentially means that the Prime Pack allows you to make desktop-scanner-quality scans with the flexibility of a handheld scanner. This leads to an interesting question: If you do require scanning at a higher resolution than the Rapid Mode, will you get the $799 Industrial Pack and turn the EinScan-Pro+ into a desktop scanner with a great level of automation because of the included electric turntable, or get the $799 Prime Pack to perform high resolution scanning hand-held? For me, that would very much depend on the size of the objects you want to scan and if they fit the turntable. 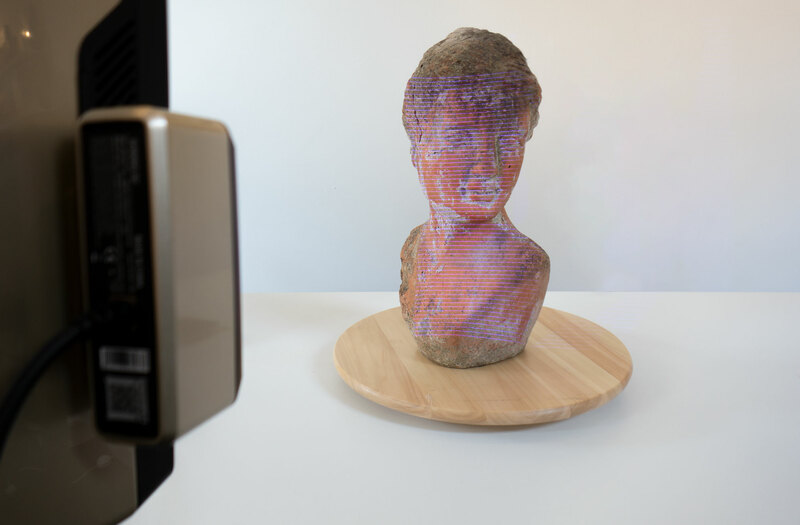 This add-on delivers scans with a level of detail that comes close to some tripod-based scanners, but with the added flexibility of a handheld scanner. Although it must be noted that that scanning in Rapid Mode is still faster and allows for a greater variety in scanning angles. I have a great interest in 3D printing. Here I have shared the most useful ideas. This technique is really very nice. This prime pack has the came with its great features in its updated versions. 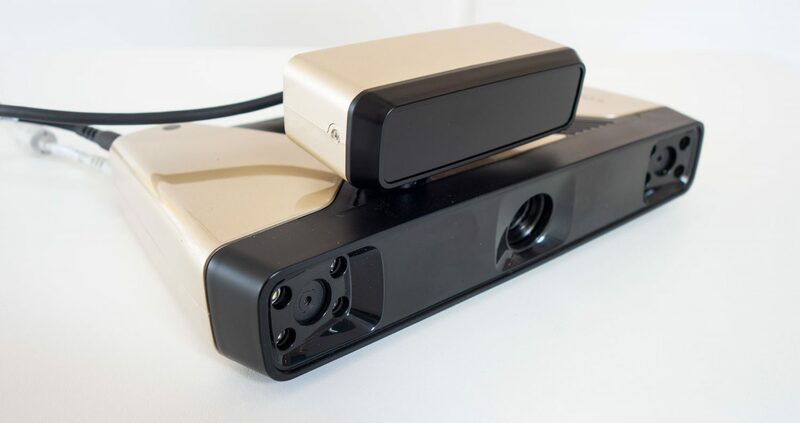 It resolves all the problems of scanning speed and also allowing marker-less tracking.